B-Body Spindles fully assembled ready to install , upgrade your discs......SOLD!!! Spindles are from a 1995 Caprice utilizing 9/16" ball joints. 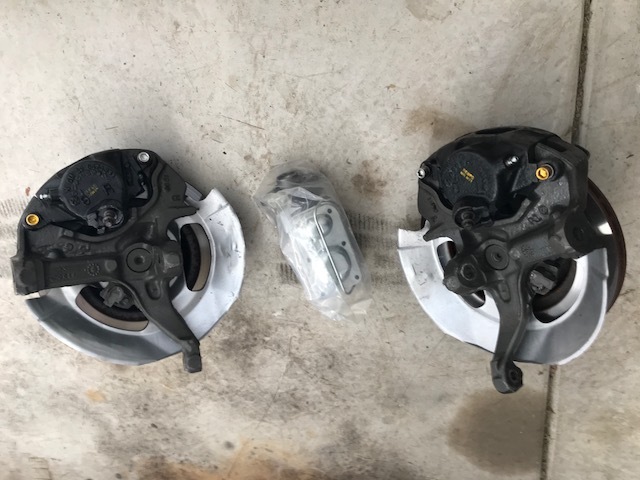 Spindles ( blasted , coated) will come assembled as pictured WITH 12" rotors, calipers , ceramic pads , new bearings, lug nuts. NEW NAPA master cylinder. Assemblies have approx. 2000 miles on them. Shipping is on the buyer. THESE ARE HEAVY !! Side note. I will be running (5 legs) in the Power Tour this year. I can hold them for a small deposit as shipping through the common carriers will be $$$. I'm in Indianapolis. Re: B-Body Spindles fully assembled ready to install , upgrade your discs......SOLD!!! Those would be 5 on 5 bolt pattern then? 5 on 4 3/4 bolt pattern. 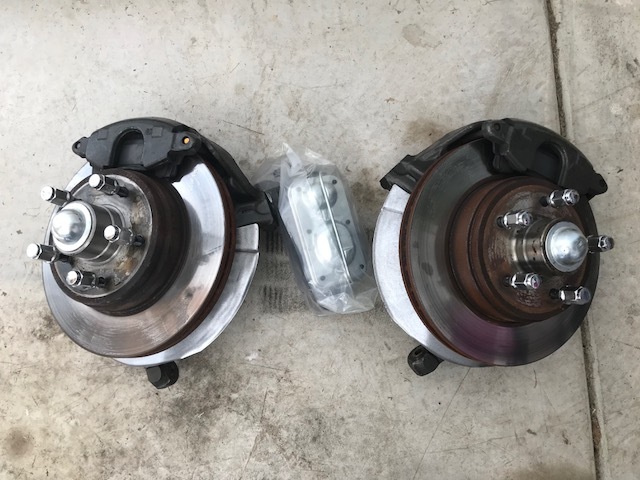 Running 1990 Camaro 1LE rotors to maintain the 4 3/4" bolt pattern. Interesting -- didn't realize you could swap the Camaro rotors onto B-body spindles. I used the 5x5 B-body rotors cuz I was specifically looking to do ABS. What are you plugging the ABS sensor holes with? Used sensors? Is the master cylinder needed for the 12" brake conversion? Might be a stupid question sir, but you mentioned 9/19" ball joints. Do they bolt to the stock control arms? need it for my application......though ABS would be cool !! As on yours. fasrnur : No the master cylinder is not needed for the conversion. Had it laying around ...to "sweetn the sell". SS , you would have to switch to the 5/8" ball joint. I'm strongly thinking about buying them impalamonte. There is a gentleman that lives in Indy that is going to a Chevelle show in June that I'm am also going to. I might be able to talk him into picking them up from you and bring them with him. I'll let you know in the next week. If you can sell them before that, I'll understand. I do appreciate all the great information though.